So that brings the curtain down on another exciting week of County Championship cricket. The highlight of day four had to be at New Road where Worcestershire reached a target of 401 to beat Northants. Yorkshire also closed the gap on Division One leaders Middlesex with a 305-run victory over Nottinghamshire at Scarborough. Paul Grunill is back with the next live text commentary on Sunday as Yorkshire take on Surrey in the semi-final of the One-Day Cup. That match starts at 13:00 BST. Until then, goodbye and have a great Bank Holiday weekend. And there it is, the second thrilling chase of today is done and dusted. Phew, I think I need a lie down. Great over for Sussex - Ben Brown hits Timm van der Gugten to the boundary and finishes the over with a three. Blimey, the TMS team have been busy today! Meanwhile back in Cardiff, Sussex are creeping towards the winning line. Unbelievable! Worcestershire have chased down 401 to beat Northants. Joe Leach finishes the match with a six off Ben Sanderson. 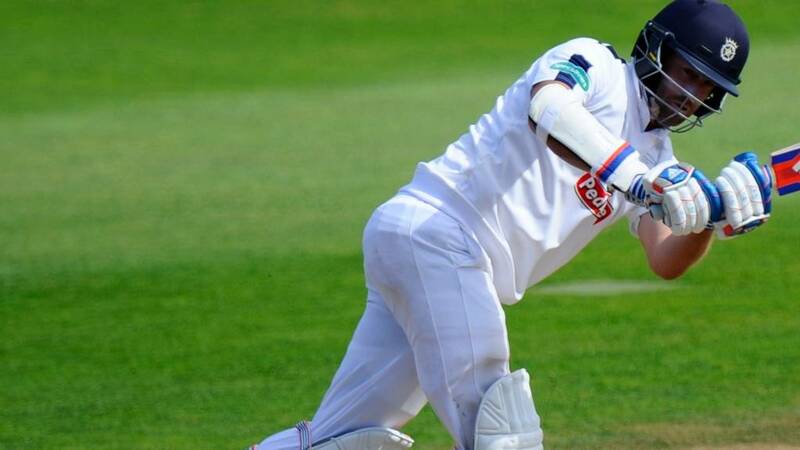 It's Worcestershire's highest-ever run chase at New Road and the second best in their history. What makes it even more extraordinary is that Northants scored 551 in their first innings. Hats off to both captains though who made sure the game went down to the wire with some smart declarations. Even bigger boundary at New Road as Jack Shantry finds the ropes off Ben Sanderson. Big boundary for Sussex. George Garton hits Graham Wagg for four and the target is down to 14. Joe Leach to face Ben Sanderson. Drama at New Road. With just 10 needed, Ed Barnard nicks Ben Sanderson behind. Three overs left, Jack Shantry joins Joe Leach in the middle. The game takes another twist at the SWALEC. Timm van der Gugten picks up his fifth wicket as Danny Briggs chips him to Craig Meschede at mid-on. Sussex need 22 off 8.1 overs. Eight runs come off Rory Kleinveldt's over to put Worcestershire back in the driving seat. If they reach their target of 401, it will be the second-best chase in Worcestershire's history. The 449-9 they made to beat Somerset in 1996 remains their highest. Surely this is Sussex's to lose now? Danny Briggs and Ben Brown have put on 50 in 7.3 overs. Oh, it's getting very tense at New Road now. The scoring has slowed down and Worcestershire need almost a run-a-ball. No nailed on result in this one yet. Are Sussex now slight favourites? Danny Briggs has changed the complexion of the match with his 29 off 26 balls. A wicket could change things though. Anything Danny Briggs can do at Cardiff, Joe Leach can match at New Road. The Worcestershire all-rounder hits Chad Barrett for three fours in four balls to take the target down to 34 off 10 overs. I'm going to stop making predictions, I have no idea which way either of these games are going to finish. Danny Briggs has come out swinging! The 25-year-old hits Michael Hogan for three fours in an over and then finds another boundary off Craig Meschede in the next. Sussex need 52 off 14 overs. Both our remaining games are going down to the wire. Okay, maybe things aren't so set in stone at New Road. Ben Cox is out two balls after Ross Whiteley, caught at mid-off. Ed Barnard, who is a fine young batsman himself, comes to the middle.